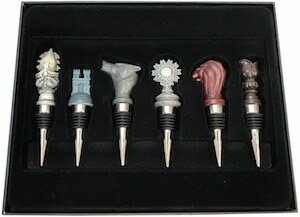 Now Game of Thrones and wine lovers will like this set of Game of Thrones Wine Stoppers. This is a set of 6 bottle stoppers and each have a different sigil of one of the Game of Thrones houses on it. You will find a wine bottle stopper for Greyjoy, Frey, Stark, Karstark, Lannister, and Tyrell. Maybe you don’t have 6 open bottles of wine but you can just switch it up once in a while so that you can show your Game of Thrones love to your wine bottle and all your drinking friends. Get ready for watching all the episode of Game of Thrones while drinking some wine. A Star Wars fan that likes wine need this Death Star bottle stopper. No need for making your wine go bad when you didn’t finish that bottle because this bottle stopper can prevent air from getting to your left over wine. The bottle stopper looks really nice and classy and that makes it perfect for any Star Wars fan that like wine. A wine bottle stopper like this does look great even in the fanciest wine cellar. The bottle stopper looks like most bottle stoppers do but this has the Death Star from Star Wars on the top. Star Wars fan that like to drink some wine while watching their favorite movies are in luck. 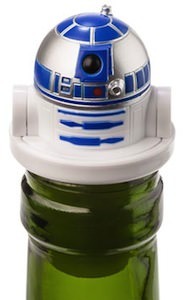 Now you don’t have to finnish your bottle any more because now there the perfect bottle stop shaped like R2-D2 th fun an little droid from the Star Wars movie. This R2-D2 bottle stop will fit most wine bottles and is easy to reuse over and over again. The Star Wars bottle stop is made from plastic and that makes it super easy to clean. Of course this bottle stop is a fun little gift for a Star Wars friend or maybe even your dad. Doctor Who fans just have to see this bottle stopper. The top of the stopper is a Dalek one of Doctor Who’s worst enemies. Now you can have a party and not worry about left over wine as you can now close the bottle with this Dalek Bottle Stopper. The details of the Dalek are realy nice and a true fan of the doctor will need this in the collection. So if you are a fan of Doctor Who then come check out this Doctor Who Dalek Bottle Stopper.